Review: My Mother Said I Never Should. (touring) Derby Theatre – East Midlands Theatre. In a recent interview My Mother Said I Never Should playwright Charlotte Keatley explained that she felt her play is very relatable. It is about four generations of family – containing both working and middle class characters and critically and crucially about love – how we show it and also withhold it. We learn about their states of ambition and what it means to each generation. Keatley wants it to be both funny and moving and a play that gets reactions both from the audience and the actors. Above all she wants her audience to be moved. And it works on all these levels – taking the ordinary and giving us extra-ordinary insights into womanhood and relationships in return. Specifically she says “Since I wrote it in 1987, there are still very few plays which show women’s lives as they really are – the day to day, ‘ordinary’ lives, not women being super detectives or political heroines, but the less visible way in which women can change society: how we raise the next generation. This is a pretty massive responsibility but one which is still not seen as a hugely important ‘job’. Her George Devine award winning play has been translated into twenty-two languages and spans, in a non-chronological way, the periods from the 1940s to the late 1980s and finally back even further to the 1920s. It considers how things change from generation to generation but sometimes also stay the same. It is about influence and change and Charlotte Keatley combines realism both stark and poetical, in her very detailed characters and grounded drama. Premiering in 1987 at Contact Manchester this play was chosen by the Royal National Theatre in 2000 as one of the hundred significant plays of the Twentieth Century. This finely acted touring production by London Classic Theatre is a superb presentation that we highly recommend. It runs at Derby Theatre until Saturday 9th March. 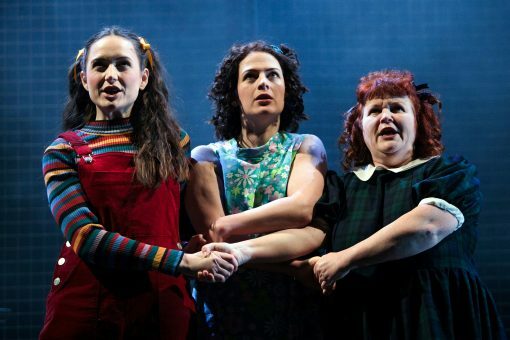 The piece is directed by Michael Cabot with Judith Paris as Doris, Lisa Burrows as Margaret, Kathryn Ritchie as Jackie and Rebecca Birch as Rosie. The abstract stage design is courtesy of Bek Palmer and coupled with Andy Grange’s superb lighting both really do serve this unpretentious and poetically subversive, totally absorbing play, well. In the best sense of the description – it works like an absolute dream. Within its playwrighting structure My Mother Said I Never Should uses The Wasteland – a place where girls come to play as core to the women’ world. A place of discussion and play – of debate re the nature of human worth and Motherhood. And as the non gender specific term ‘playwright’ can mean; the job itself is a maker of a vehicle in which people will make journeys. This reviewer finds this term especially fascinating in this female context. As we constantly move from Manchester, Oldham and London; as we examine the expectations of men and women in these lives depicted; as we circumnavigate the kaleidoscopic time structures and how they will affect the four women involved we can be certain of a few things – our lives themselves will be enriched by Keatley’s poignant, bittersweet play about differing choices, love, jealousy, opportunities and pressures on women and the true price of freedom. Age guidance 13 years old. (contains strong language). For more touring dates check out London Classic Theatre. Review: Madagascar The Musical. (touring) Leicester Haymarket Theatre. Promo: Derby Theatre Family Day. Saturday March 16th.